Here's everything you need to know about the past week on the Big Brother Live Feeds. The Houseguests were hit with a major twist at the start of the week when Scottie returned only a week after being voted out. Despite his victory at the Jury Battle Back, Scottie failed to nab the HOH win that would assure his safety. 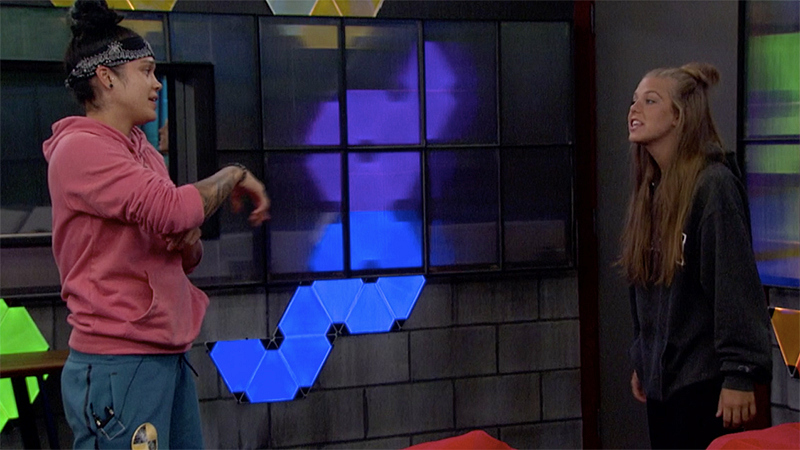 Worse still, neither did Haleigh, who narrowly lost to Tyler. This meant Tyler had two easy targets to put up on the block for the week. Kaycee won the Veto competition and did not use the POV out of loyalty to her ride-or-die Tyler. Scottie spent the week blissfully unaware that the house wanted him gone, even feeling bold enough to tell Haleigh Tyler told him he was the pawn. Which did nothing to soothe Haleigh's fears that she'd be leaving the house. Though Level 6 prepared the Live Feeds for another of their classic blindsides, Tyler is feeling the heat of having made promises he'll eventually have to break, especially with JC who sees his hold over Tyler slipping. And with a double eviction coming up next week, the time for hard decisions rapidly approaches. The first three contestants to drop out from the last HOH competition were declared Have-Nots, which meant JC had to eat nothing but slop for the week. 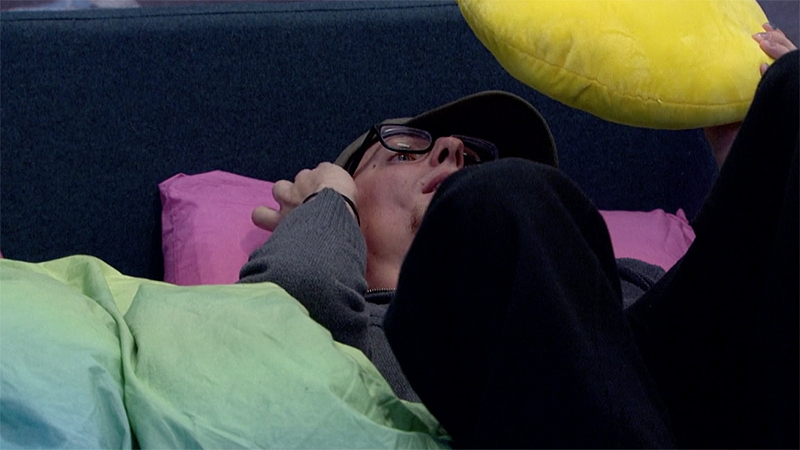 JC has made it clear he isn't the cheeriest of housemates when hungry and everyone felt his wrath this week. JC was more than a little disturbed to find Scottie was the one to return to the house, seeing him as one of the few Houseguests outside of JC's influence. Thus he put into motion his plan to break Brett away from the foursome of Level 6, keep Sam in his pocket, and try his hardest to hold onto his reins on Tyler. When not moping in his Have-Not saucer, JC spent his time whispering into almost everyone's ear, but his bad attitude has started to give away what he's playing at and Tyler made it clear he's not going to be pushed very far by JC. Whether due to his increasing concern for his own safety in the game, or the stir-craziness that sets in when on indoor lockdown for days, Brett's temper started to get the best of him this week. He moaned loudly and often to his Level 6 friends about Sam and her increasing number of things piling up in the house. He even questioned her sanity to her face, but Sam only laughed it off. Brett's worst moment of the week may have been a spat with Haleigh over some splashed water where he insinuated her continued pranks against him could mean Scottie becomes his preferred Houseguest. A low blow, considering the lengths Haleigh has gone to stay friendly with everyone despite her position on the block. She cried to Kaycee and Angela later and both agreed Brett went too far. 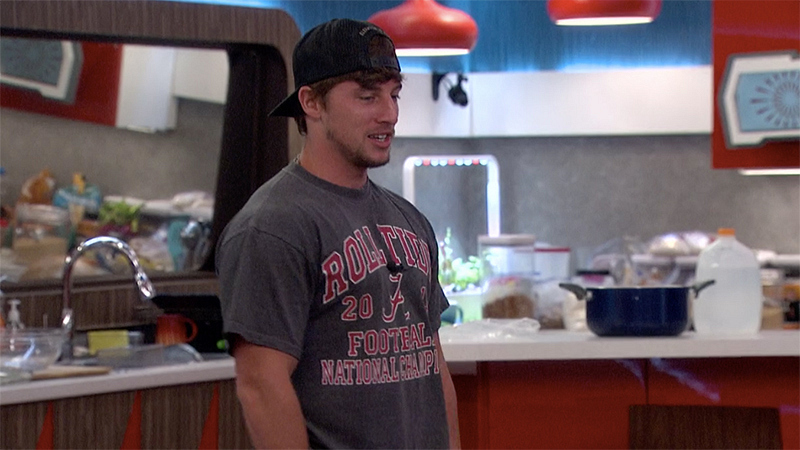 Were Brett's mood swings a result of JC's continued efforts to chip away at his confidence in his alliance? On several occasions JC pointed out Tyler and Angela's blossoming showmance, as well as Kaycee and Angela's clear devotion to one another. Despite the Final 2 he has in place with Tyler, Brett is clearly starting to have his doubts. In one especially harebrained moment, Brett pitched to JC that the two of them should consider roping in Sam for a three-person alliance. JC rejected the notion but was Brett really considering abandoning his group or just trying to create a scenario that would make JC look bad later? Being up for eviction together didn't do much to help rekindle Scottie and Haleigh's friendship, especially since Haleigh worked overtime this week to get on good terms with Tyler, Angela, and Kaycee in preparation for maybe staying in the house. Scottie wasted no time trying to get back into Tyler's good graces, even campaigning against Haleigh—albeit not too harshly—by leaking that Haleigh had Final 2 alliances with everyone in the Jury house. Scottie spent much of his time with Sam, putting on hilarious cooking shows, playing whatever strange games Sam devised, and crafting with her. He also beat Angela and Kaycee in a game of indoor HORSE. Still, when Haleigh had some dark moments this week, Scottie was there for her and attempted to cheer her up one evening by giving her hilarious suggestions on how to campaign against him. Despite most definitely being Level 6's next target, Haleigh made strides in her relationships with Angela and Kaycee. 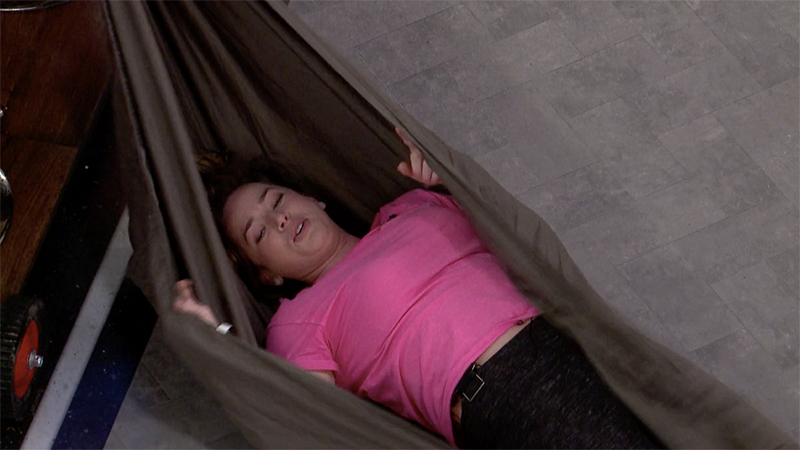 She shared a rare hammock hang-out with Angela in the backyard where the two complained about Sam, and Kaycee and Haleigh revived a game they hadn't played in years. The bros, on the other hand, spent a night enjoying moisturizing face masks, though none of them quite understood how they were meant to function. Kaycee and Angela had already created their own superhero personas using face masks earlier. 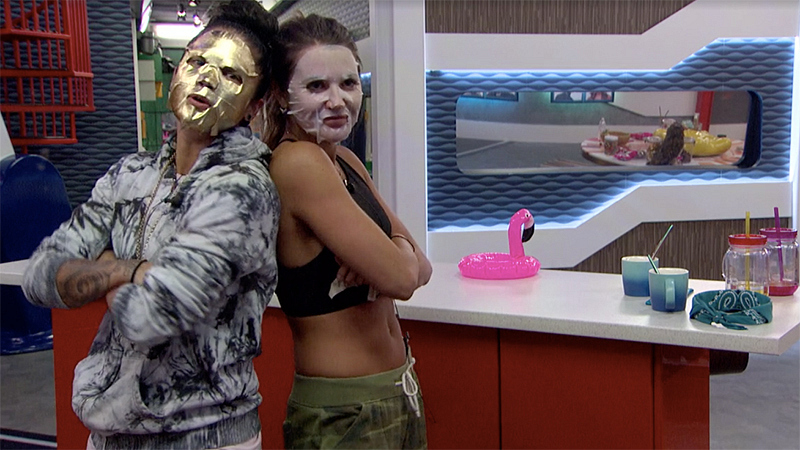 At least the Houseguests should all have shining clear skin for the week! 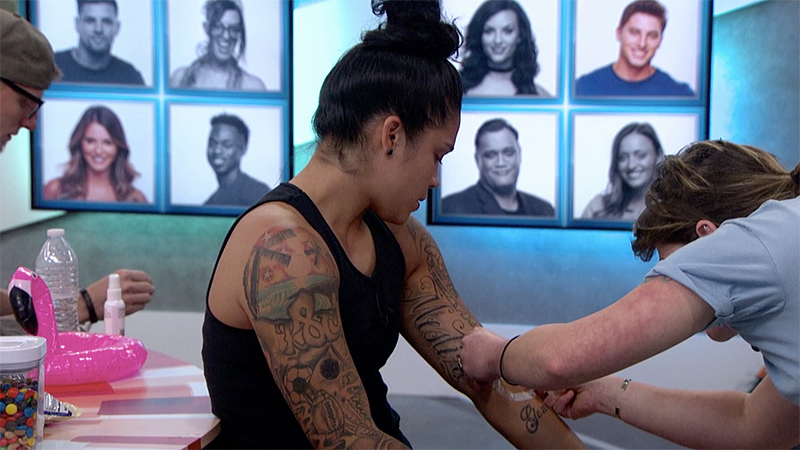 Sam continued to think she has close friends in the game and got good time in with Kaycee by helping her craft a Veto sticker in order to make a sun-tattoo of the symbol in honor of her recent wins. Sam and Scottie got plenty of time in, as well, cooking, cleaning, crafting, and sharing stories together. Sam the Stylist fashioned Brett's hair into a clean dapper look, and as a fellow Have-Not, she spent plenty of time doing her best to cheer up grouchy JC. Despite all that Sam does around the house, her mood swings and eccentricity continue to get under the other Houseguests' skin. Especially when she kept a few of them from sleeping with loud late-night stories. Scottie's return, while initially a shock to the house, only led to a repeat of the past few weeks' game plans: Get Haleigh and Scottie out of the house. However, though this week was anything but a re-run on the Live Feeds. Scottie came in with Jury knowledge and after his inevitable eviction Thursday night, he returns to Jury with even more info. Will he sway the Jury's votes? Haleigh remains in the house, but will clearly be a target by new HOH, Kaycee. Will she finally be able to Veto herself to safety? And how long will Level 6 let JC continue to threaten their game with his devious plans? Right now the web of partnerships formed in the house are being stretched dangerously thin and next week's Double Eviction means those strings—-and possibly Houseguests as well—are sure to SNAP! 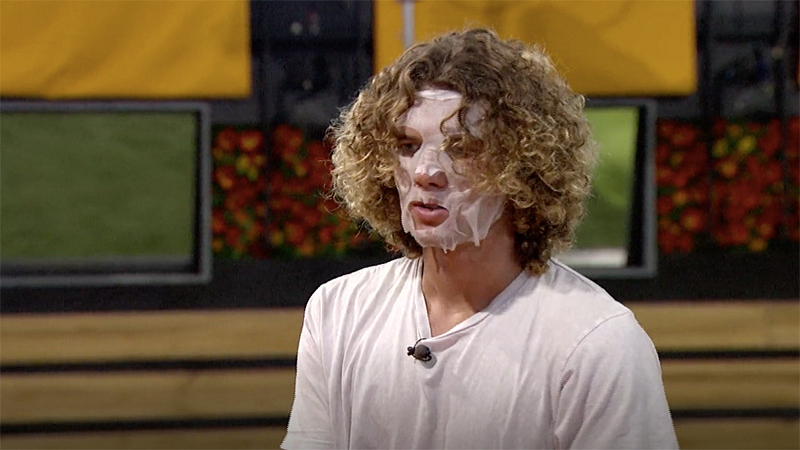 Don't miss all of this action on the Big Brother Live Feeds—exclusively available through CBS All Access. And be sure to tune in to all-new episodes of Big Brother on Sundays and Wednesdays at 8/7c, and Thursdays at 9/8c—always on CBS and CBS All Access.